Little Boots, Big Fun! It’s Svengoolie At The Little Boots Rodeo! Horror hosts can truly pop up anywhere. A fan of horror hosts would probably expect to see them on the guest list for a convention, would not be too shocked to see them appearing at a haunted house or other horror-themed attraction, and would only be mildly surprised to see one in another’s show. Last year, I must admit that I was very surprised when I found out that Svengoolie would be appearing at a western-themed event: The Little Boots Rodeo in Elk Grove Village, Illinois. Upon Sven’s arrival that day, he and the mayor of Elk Grove Village faced off in a mechanical bull-riding contest. Some rooted for Sven, some for the mayor, but all were definitely having fun! 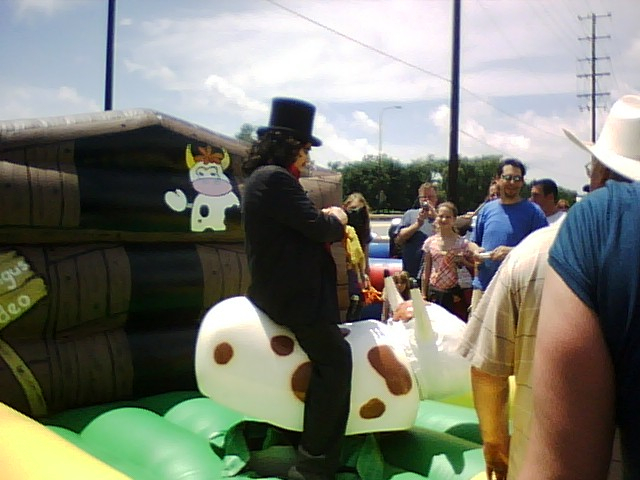 The mayor ended up falling off of his bucking bronco, and for a moment it looked like Svengoolie was the winner; then, however, some good-natured “protests” began, with the mayor pointing out that Sven had held onto the bull with both hands, instead of just one, but the validity of Mr. Goolie’s extra “edge” being questioned by the fact that he was holding a rubber chicken in that hand. The eventual “final call” was hard to discern (I remember someone calling it a tie), but according to Mr. Goolie himself, the mayor apparently won. The Windy City Goolie faces off against the Midwest Mayor! After the daring duel, Sven made his way over to the table that had been set up for him, where a line of fans waiting to meet him face-to-face was already forming. 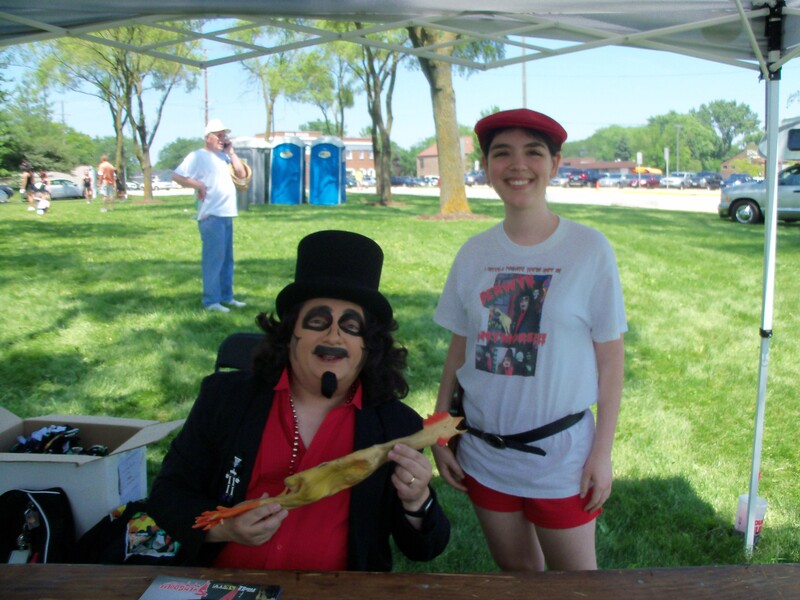 Meeting Svengoolie was, of course, fun, exciting, and definitely a highlight of last year’s event! Although there were certainly so many attractions set up that day, it was just that: One day, which left hardly enough time to see and experience anywhere near all of them. The weather didn’t help much, either; it was a clear, bright, sunny day, but it was hot! Of course, this was completely out of the Rodeo’s control, and most people dressed for the weather. But even as all of us fans took the term literally and fanned ourselves (and sometimes each other) while waiting in line, the heat suddenly seemed much less intense as we all realized: Svengoolie must be roasting! This year, The Little Boots Rodeo was expanded to a two-day event (instead of just one), held on June 25 and 26. Many attractions and events that made the previous summer’s Rodeo so much fun returned (thankfully, the heat and humidity did not), including Sven, who was slated to appear both days that weekend. He and the mayor had arranged a rematch, although not on the two mechanical bucking broncos that had also returned this year. Instead, they would face off in a… duck race! The way this worked was that each human contestant was given a live duck to hold in his or her hands, then assigned to one of four lanes that stretched across a tank of water that was probably only about a foot deep. When the supervisor/referee sounded, appropriately enough, a duck call, they would release the ducks, and the fast fowl would then half swim, half fly across the pool. The first one across the finish line, of course, was the winner. The ducks were then collected and returned to their holding area. The actual length of each race was only a few short seconds, so you could literally blink and completely miss it. Just before their big competition, Sven and the mayor made some introductory remarks. Svengoolie’s comments were particularly witty and certainly pleased and entertained the crowd. “You know, I’m most of the time used to chickens, so I’m not real well acquainted with ducks. But you know what, if I lose, you can put it on my bill!” he quipped. “No money down!” he continued. “You ever watch Me-TV? We have shows with Jack Webb.” He probably could’ve gone on like that forever (and we all would have stayed without a second thought), but after the joke about Jack Webb, he sighed, “Okay…” and handed the microphone over to the mayor. “I’m always glad to get down with Svengoolie, and we’ll see who the real man is today with the ducks! So Svengoolie, we’ll go Round Two!” He and Svengoolie shook hands, and received their designated ducks. “The more you splash them, the faster they go,” one announcer hinted. Finally, it was time for the moment of truth! At the sound of the duck call, the ducks were released, and off they went! It was definitely a very close call, but there could still be little doubt that Svengoolie’s duck had come out ahead by just a fraction of a bill. Just like the previous year, both Sven and the mayor were very good sports, and the ducks were surprisingly cooperative. I saw a few races before Sven had arrived, and was genuinely impressed by the ducks’ good behavior: There were no attempts to bite their handlers, whether supervisors or contestants, and they remained calm and relatively still while being held; so much so that even the youngest of cowpokes could hold them safely and securely without worry of injury or accidentally allowing the birds to fly off into the clouds. The dexterous ducks also never attempted to “fly the coop” during or after any of the races I witnessed. Svengoolie’s table and tent were thankfully set up in the shade, and he made his way over there to sign autographs and take pictures soon after the big race had concluded. Of course, a line was already forming. Waiting in line can actually be quite fun if you take the time to take in your surroundings, especially the people waiting in line with you. It’s always fun for my family and me to overhear fan’s stories about Svengoolie, and since The Little Boots Rodeo attracts so many, shall we say, “little boots”, we heard more stories than at most other appearances as so many enthusiastic parents excitedly explained to their little buckaroos just whom they were waiting in line to see. Some told tales about growing up watching Screaming Yellow Theater and/or Son of Svengoolie, while some attempted to help them comprehend that they were going to meet the man they watch on TV every week. It was also amusing when, while waiting in line once more on Sunday morning, two men behind us became deeply involved in a conversation/debate with each other about the history of Sven, what years each incarnation aired on television, and whether he was a ghoul, a vampire, or something else entirely. My family did actually visit him both days that weekend, and on Sunday, in a rare and unusual occurrence, the length of the line actually seemed to alternate from growing exponentially to suddenly stopping. Strangely enough, it stopped shortly after we arrived in line (maybe word spread that I was there…), leaving only the two aforementioned men locked in intense discussion waiting patiently behind us. For some reason, it still throws me for a loop whenever Svengoolie recognizes me in line. According to my parents, it surprised the two men behind us as well. At any rate, due to the sudden halt in the growth of the line, we were able to chat with Svengoolie for a little bit longer than usual, which was a nice and unexpected treat. Thank you again, Mr. Goolie, for my family’s and my day! Oh no! It’s the revenge of the homemade shirt! After meeting Svengoolie each morning, we were able to trail blaze through the rest of the rodeo. Now, The Little Boots Rodeo is primarily geared toward just that: Those with little boots. On the upside, there are practically endless activities for the junior sheriffs to participate in, including a cowpoke costume contest, but rest assured, there’s still plenty to do for those of us with bigger boot sizes. 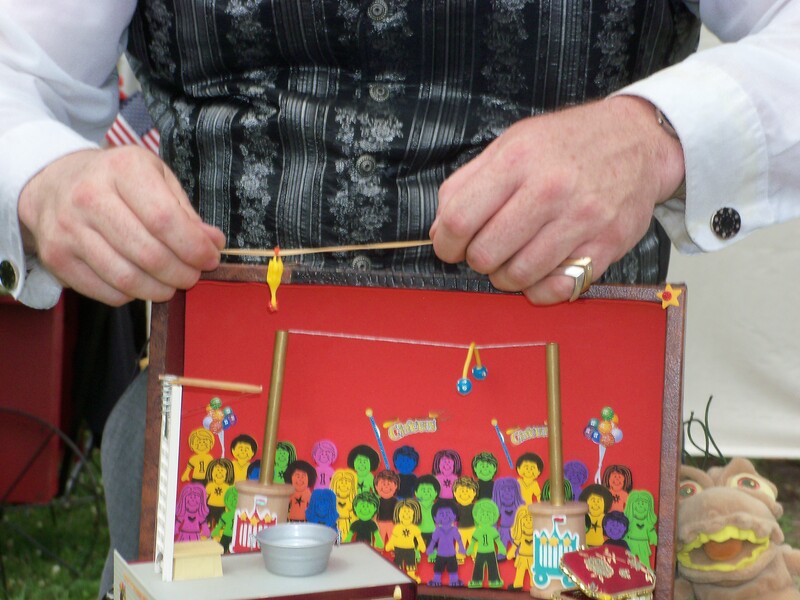 Of course, there are various vendors selling a wide variety of items. If you don’t prefer to shop around, there are also the aforementioned duck races and mechanical bucking broncos. However, a bit of warning for fully-grown cowpokes who have a hankering for trying their luck on this last one: Sure, it may be wild enough to successfully buck a rustler who’s knee-high to a grasshopper to the inflated terrain below, but for pretty much anyone who’s tall enough to not need help saddling up for the challenge, it’s not much more than a nice ride found inside your friendly neighborhood mall. If you want to sit down and rest your tired dogs for a bit while still having a Western experience, there is also a horse-drawn covered wagon at the edge of the grounds that periodically departs and takes passengers on a leisurely ride along a few local roads before returning to the Rodeo once again to reload. For something a little more interactive, cowpokes of all ages and boot sizes can go into the petting zoo. It had many of the typical animals one would expect to see at such an attraction: Chickens, goats, etc. There were a few llamas, one of whom was very quick to grab any and all food, and who startled many people, from small children to their parents. There was also a very docile donkey, as well as a spunky young one. Smile for the camera! It’s Sven’s bodyguard! Just kidding. 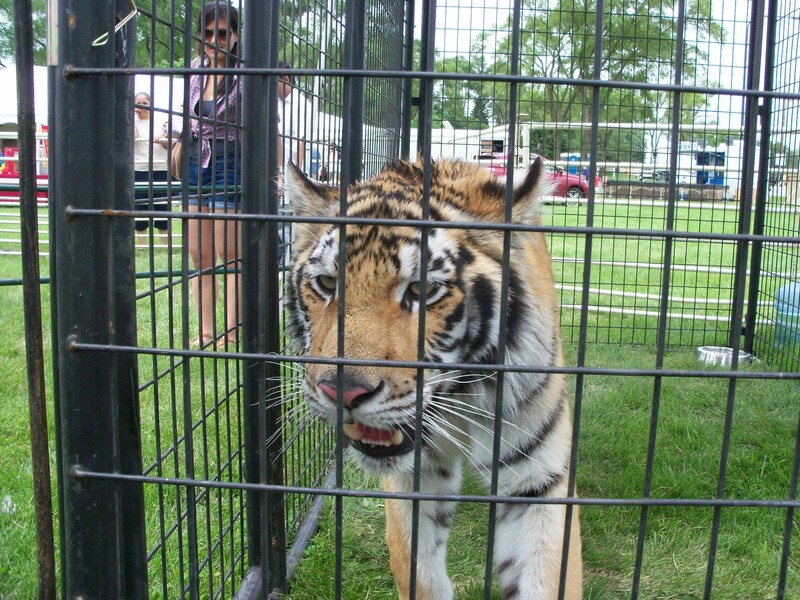 And before you ask: No, we were not allowed to pet the tiger! (Cue Svengoolie sound effect: “Oh, darn!”) When I first heard them interrupt the country music that set the atmosphere during the entire event (or, at least, for as long as we were there) to announce that there was a real, live tiger in the petting zoo, I thought for sure that they were joking. Although curiosity quickly got the better of me and had me making a beeline for the attraction in question, I figured I’d see a person in some sort of amusing tiger costume, or perhaps a tiny cub held by a professional handler in the same way that you might see a lizard, snake, or small alligator at a zoo. What I found once I arrived there, however, was nothing of the sort. Quite frankly, I was surprised that more people weren’t coming over to see the tiger. Perhaps it was because there were just so many other things to do. 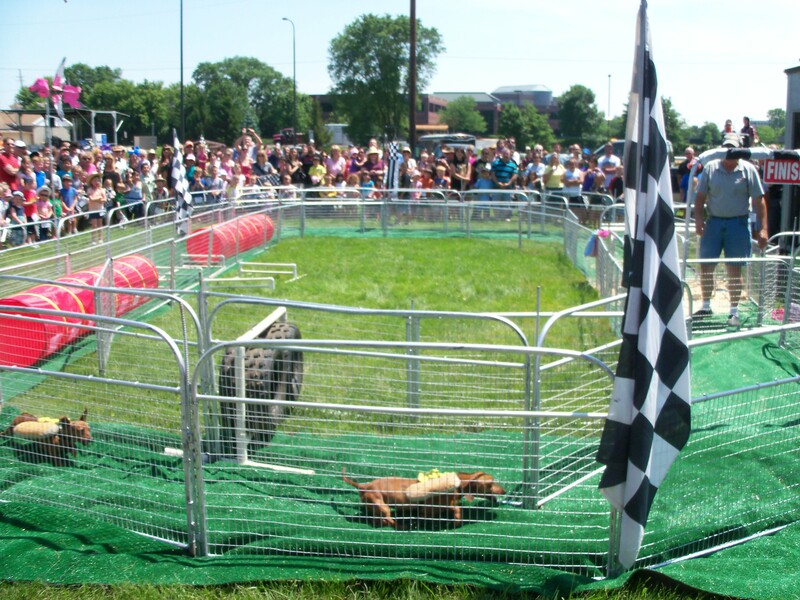 For those who want to watch more animal races, at set times during the day, “Hot Dog Pig Races” were held. This is a slight misnomer, however, as at certain points during the series of races, the contestants would be Dachshund hounds instead. Each race had a “theme”, such as “celebrities” or “superheroes”, and the racers were given appropriate nicknames, as well as a colored flag on their backs to help you keep track of your favorite contestant. 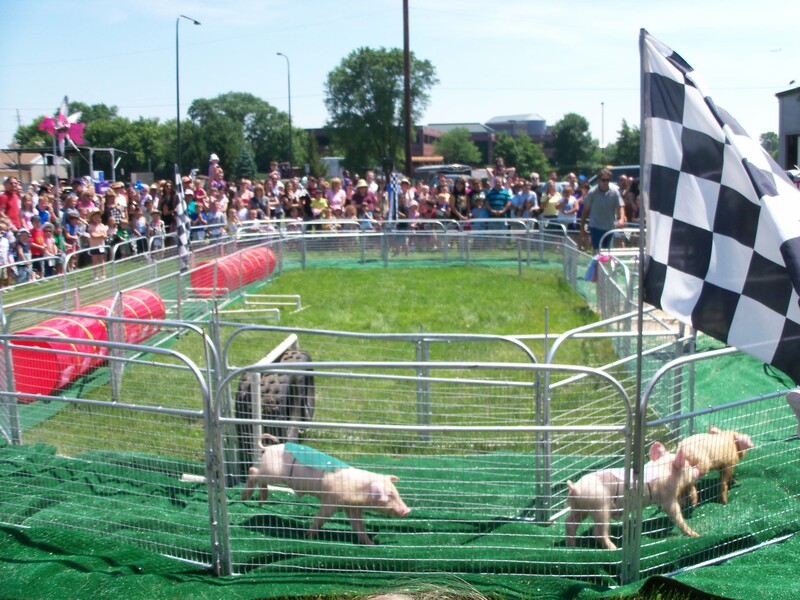 For instance, during the “celebrity” race, two of the pigs were dubbed “Kevin Bacon” and “Jerry Swinefeld”; during the “superhero” race (done by the dogs), one racer’s designated secret identity was “Underdog”. Despite the presence of Jerry Swinefeld, this is not a “race about nothing”. This race has gone to the dogs! One of my personal favorite parts of the event (besides, of course, meeting Sven) was Professor Grifter’s Traveling Medicine Show. Basically, it was a magic show with a Western theme; he would “demonstrate” how one of his many elixirs worked through magic tricks. 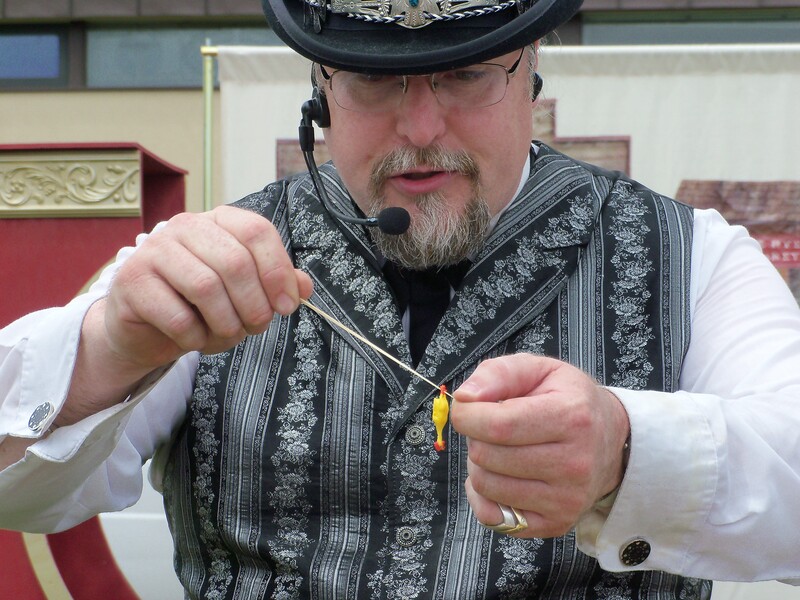 I have to admit that I had seen some of the tricks before at other magic shows performing at community events, but quite a few were new to me as well. He did have a unique spin on the act by masking it as a “medicine show”, his accompanying shtick was, as would be expected of a magician, corny yet still very funny, and he performed all of the tricks adeptly and without a hitch. He did it! Let’s hear it for Hercufleas! 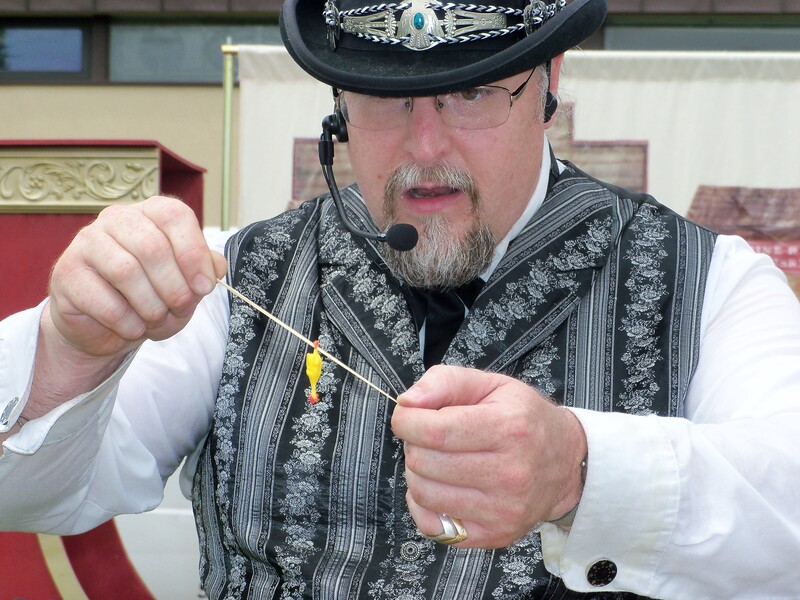 Professor Grifter and his medicine show and flea circus were, admittedly, kind of hard to ignore, as the performer had a pretty loud microphone that he was consistently shouting into, allowing his voice to be heard throughout the grounds of the Rodeo. My final verdict on the Little Boots Rodeo? While it may not keep the entire family occupied for the whole day, it is definitely worth a stop for anyone in the area! As the name suggests, the “little boots” in your roundup gang will probably find the most to do, as the majority of the activities are tailored specifically towards the younger set of cowpokes, but those of us who have long outgrown our “little boots” can certainly find plenty to do (after you meet Svengoolie, of course)! This entry was posted in Horror Hosts, Stalking Svengoolie! and tagged Little Boots Rodeo, Svengoolie. Bookmark the permalink. ← THE WARD vs. SHUTTER ISLAND!